“DT” one of my favorites that always slips my mind until the mainsite throws it back in rotation. PS: I looked awesome for the first 30 seconds of this WOD. 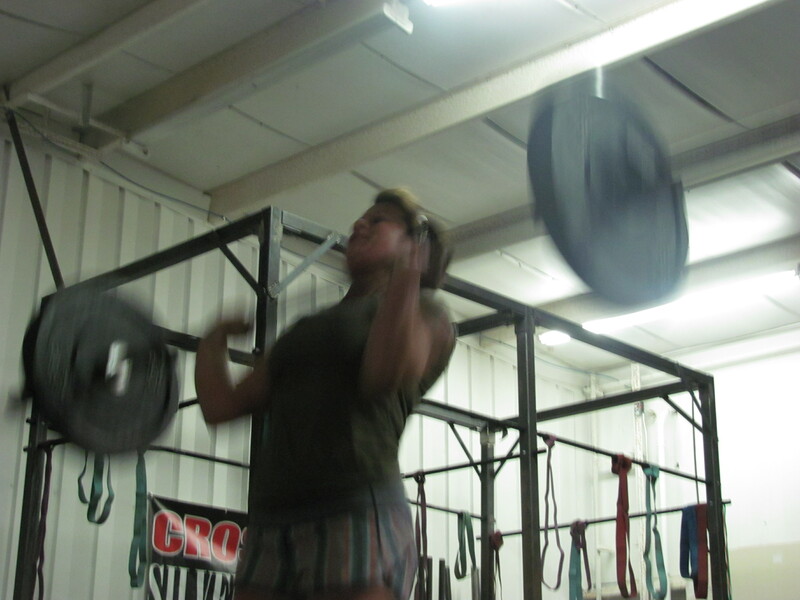 I managed the deadlift and push jerk sort of, but it was the hang clean that really killed me. I don’t think I did more than two at a time even on the first set. Ouch. Sometimes you gotta hit the wall just to see what it feels like. But, next time I say “Okaaaay” with an arched eyebrow you have a better idea what’s in store. Like comparing to past times, when there is improvement! 10:20 on 7/14 used the same weight today (135lbs) and cut a bit of time off 7:29 today. Ryan I am impressed that you stuck to your weight and finished. Very impressive! I remember this one. It took me so long to finish I think Matt stopped timing me ( maybe almost 30 minutes) And it was with 55#!!!!! 8:29 @ 115 lbs. I’ve done DT twice before, but not at CFSB. 20+ mins with 135 (don’t feel so bad, Ryan) and 13:45 @ 115. Shaving 5+ mins at the same weight feels pretty damn good. Competition and camaraderie are good things. 7/14 was 10:20 @75lbs… tonight I did 95lbs with a time of 8:52.. was pretty happy with that considering I haven’t gotten a workout in a since the 21st and have eatin like crap in that time frame.. So glad Christmas is over, time to get back to normal!!! Whatever your eating, I’ll take some of that. That’s awesome, Marianne!! Its always a great feeling to reach the goals that you set for yourself!! !